On Friday 10th and Saturday 11th July a mix of planners, developers and project managers came together for the second Kent Design Summer School. 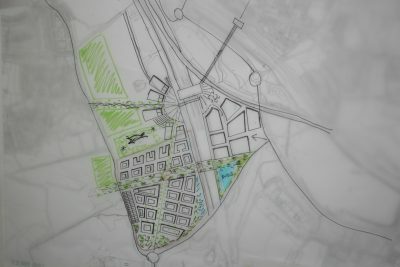 This year’s school focused on the Ebbsfleet Garden City and developed proposals for the station quarter north – a complex site that could be the main gateway to the Ebbsfleet Garden City and the adjacent London Paramount scheme – which currently combines the International Station and its car parking, the River Fleet, a landfill site and major and local roads. On the first day we received a briefing and site visit from Louise Wyman, Strategic Director for the newly formed Ebbsfleet Development Corporation and from Peter Nelson, Managing Director of Camland Development. Supported by leading practitioners Steven Proctor, Marcus Wiltshire and David Rudlin, the ‘students’ worked through the process of understanding context, place and map making. Three groups worked in competition to develop a scheme that met the needs of the client and responded to site and embraced the excitement of the Garden City. The groups’ work was presented to a Dragon’s Den for judging with the winning team being able to communicate their approach and response. When asked how they would sum up the Summer School in a sentence we were told “Absolutely brilliant”, another said “A great opportunity – inspirational and exhausting” and another said “Extremely good. Interesting, varied, challenging and very enjoyable. Good structure and mode of delivery, and pace just about right”. If you would like to find out how your organisation can become a member of Kent Design or you are interested in attending next years event please contact kentdesign@designsoutheast.org.